Split Time. Photo by Jim McCue, Maryland Jockey Club. 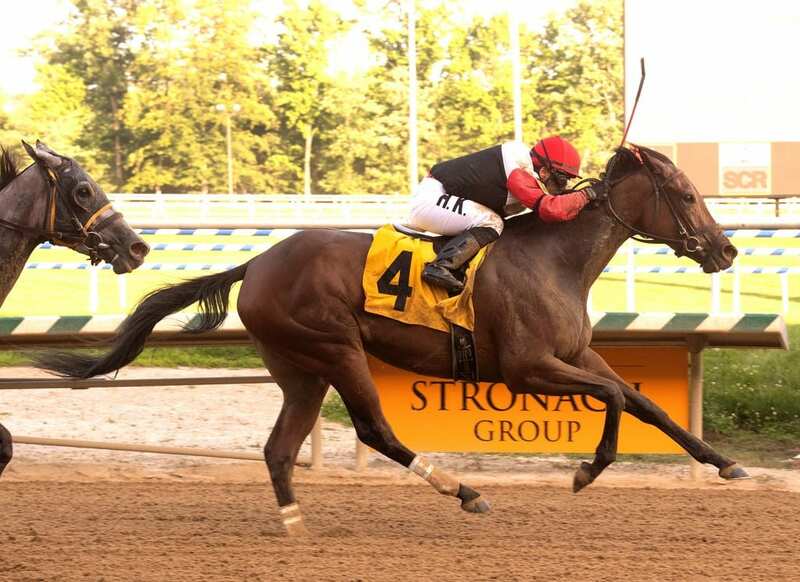 Tic Stables’ Split Time, making her open company debut in her first race outside of New York, overcame a troubled start to scoot between horses in mid-stretch and earn her second career stakes victory in Saturday’s $75,000 Alma North at Laurel Park. The seven-furlong Alma North for 3-year-old fillies highlighted a 12-race program as the first stakes of Laurel’s 40-day summer meet which opened June 1 and runs through Aug. 19. Ridden by Horacio Karamanos for trainer Linda Rice, Split Time ($8.40) completed the distance in 1:24.48 over a fast main track to win by three-quarters of a length over fast-closing 45-1 long shot Norma’s Charm. They were followed under the line by multiple stakes winners Limited View and Almond Roca, Aggregator and 6-5 favorite Elevenses. It was the fourth win from six career starts for Split Time, a New York-bred daughter of Grade 1 winner Take Charge Indy that had raced exclusively in restricted company since her debut last December. Each of her first three wins came at one mile, including the Maddie May Stakes March 24. Split Time lost several lengths when another New York shipper, Elevenses, broke inwardly from the rail post and bumped the bay filly, forcing her to settle at the rear of the field as Elevenses sailed through quarter-mile in 22.41 seconds pressed by Almond Roca and Limited View to her outside. Almond Roca took over the top spot without resistance rounding the far turn only to yield it to Limited View after a half in 45.25. Limited View drifted out straightening for home and Karamanos was able to steer Split Time between the two rivals, forging a short lead at the sixteenth pole and edging clear. It was the second straight win on the day for Karamanos, who also took the 10th race aboard Munificent ($14.40). The Alma North is named for the Maryland-bred champion 3-year-old filly and Horse of the Year in 1971 and Maryland-bred champion older filly of 1972. Owned by the late Eugene Mori’s East Acres Stable, Alma North won 23 of 78 career starts with $513,597 in purse earnings from 1970-74. Her victories included graded-stakes scores in the Matchmaker (G1) and Vineland (G2), Margate (G3) and Betsy Ross (G3) handicaps in 1973.